The plantar fascia is a band of tissue, much like a tendon, on the bottom of your foot. It starts at your heel and goes along the bottom of your foot. 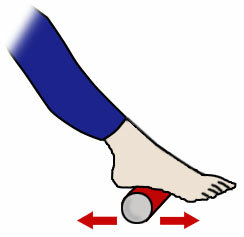 It attaches to each one of the bones that form the ball of your foot. The plantar fascia works like a rubber band between the heel and the ball of your foot to form the arch of your foot. If the band is short, you'll have a high arch and if it's long, you'll have a low arch, or what some people call flatfeet. 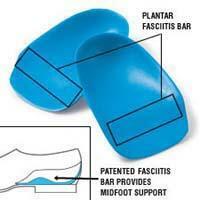 A pad of fat in your heel covers the plantar fascia to help absorb the shock of walking. Damage to the plantar fascia can be a cause of heel pain. What causes the heel pain? As a person gets older, the plantar fascia becomes less like a rubber band and more like a rope that doesn't stretch very well. 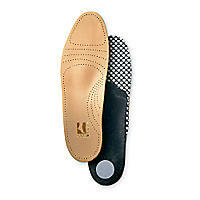 The fat pad on the heel becomes thinner and can't absorb as much of the shock caused by walking. Damage to the plantar fascia may cause it to swell, tear or bruise. You probably have pain in your heel when you stand up for the first time in the morning. Most people with plantar fasciitis say the pain is like a knife or a pin sticking into the bottom of the foot. After you've been standing for awhile, the pain becomes more like a dull ache. If you sit down for any length of time, the sharp pain will come back when you stand up again to walk. What can I do about the heel pain? If you walk or run a lot, cut back a little. You probably won't need to stop walking or running altogether. If you have either flatfeet or a high arch, ask your doctor about using orthotics, or inserts for your shoes. 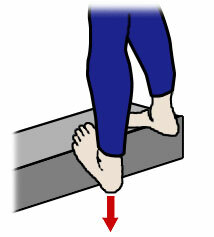 Orthotics are arch supports. You will need to be fitted for them. If you are overweight, losing weight can help lessen your heel pain. If your job involves standing on a hard floor or standing in one spot for long periods, place some type of padding on the floor where you stand. Also, try icing the heel for about 20 minutes around bedtime every night for at least 2 weeks. Are there any exercises that will help? 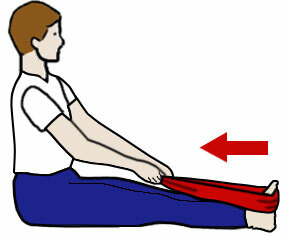 Do the stretches shown on the next page at least twice a day. Repeat each stretch 10 to 15 times. Don't bounce when you stretch. Hold each stretch for at least 10 to 15 seconds. You can also strengthen your leg muscles by standing on the ball of your foot at the edge of a step and raising up as high as possible on your toes. Relax between toe raises and let your heel fall a little lower than the edge of the step. It's also helpful to strengthen the foot by grabbing a towel with your toes as if you are going to pick up the towel with your foot. Repeat this exercise several times a day. Aspirin, acetaminophen (Tylenol) or ibuprofen (Advil, Motrin) can ease the heel pain, but talk to your doctor before you take any medicine. 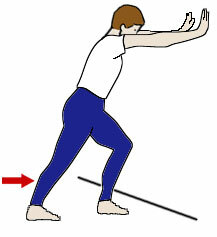 What if my foot still hurts after doing the exercises, using the arch supports and taking other measures? If stretching, arch supports, medicine and exercises don't help, your doctor can suggest other treatments. You may need to wear splints on your foot at night, tape your foot or have injections of corticosteroids into the plantar fascia. In a very few cases, surgery is needed. You and your doctor can decide which treatment is best for you.